Rashad Bishop plays forward for Vechta (Germany). Dion Dixon plays point guard for Homenetm (Lebanon). Yancy Gates plays power forward and center for Hapoel T-A (Israel). Eric Hicks plays forward for Club Africain (Tunisia). Justin Jackson plays power forward and center for Nea Kifisia (Greece). Kareem Johnson plays power forward and center for IMS Hawks (New Zealand). Donald Little plays center for Mineros (Mexico). Kenyon Martin plays forward for the New York Knicks. Jason Maxiell plays forward for the Charlotte Hornets. Titus Rubles plays forward for Keflavik (Iceland). Lance Stephenson plays forward for the Charlotte Hornets. Ibrahima Thomas plays forward for Azad (Iran). Steven Toyloy plays power forward and center for Palmeiras (Brazil). Deonta Vaughn plays guard for Anwil (Poland). Mike Williams plays power forward and center for Pioneros (Mexico). James White plays guard for Unics (Russia). John Williamson plays power forward for Ironi Nahariya (Israel). Cashmere Wright plays point guard for AEK Athens (Greece). It was a light week for Bearcats in the NFL. Both the Bengals and the Broncos had bye weeks. However, and since we published the last round-up, Kevin Huber was named Punter of the Week for the second consecutive week. The Eagles did not fare well this week as they lost to the 49ers and failed to score a single offensive touchdown. Connor Barwin had his best game of the season, though, managing five solo tackles, a sack, and two additional hits on the ever-elusive Colin Kaepernick. Unfortunately for the Eagles (and for Bearcat fans), the Eagles offense may be without a key component for the next two months – Jason Kelce. When Kelce left the game against the Redskins with an abdominal injury, many assumed he would be back within a week. Unfortunately, that jolt to his abdomen aggravated an existing hernia that has been troubling him for two years, necessitating a surgery. 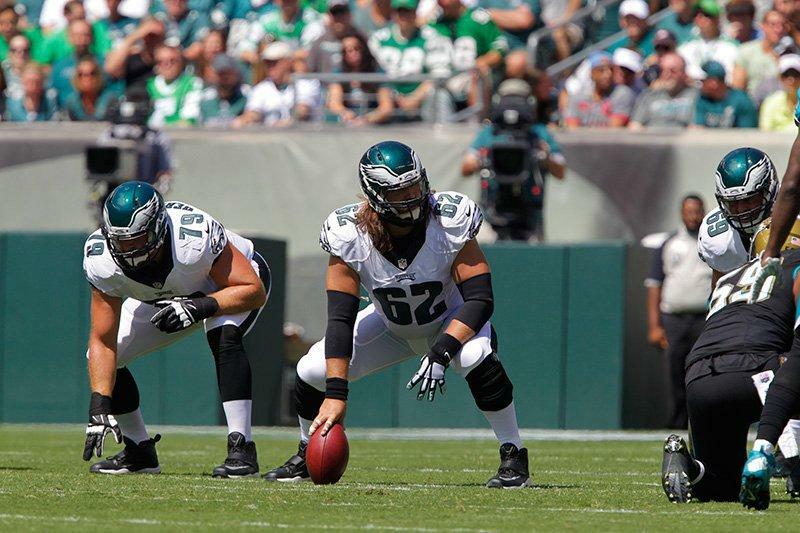 The Eagles’ offensive line has already been decimated by injuries this year. And Kelce has received a lot of credit for leading the make shift/patchwork offensive line. Now that Kelce is out, the Eagles will have to look elsewhere for leadership. 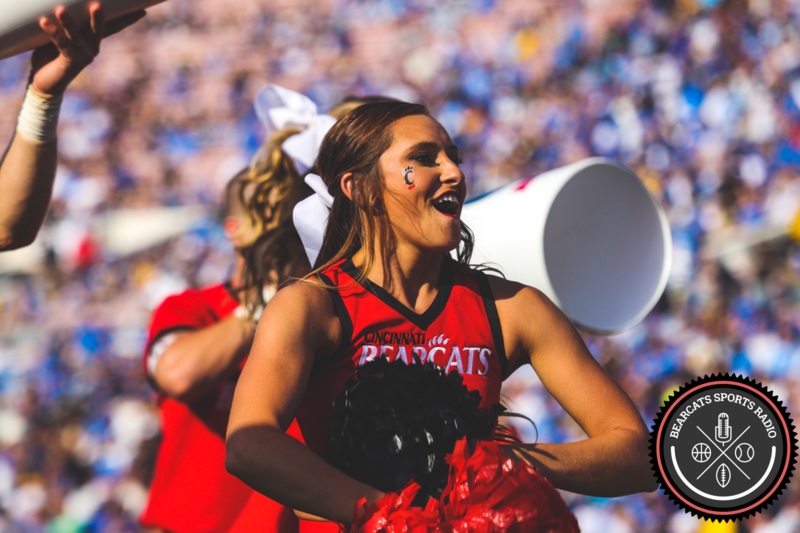 As for the Monday night game, we had one Bearcat playing, and it’s a guy we talk about every week. 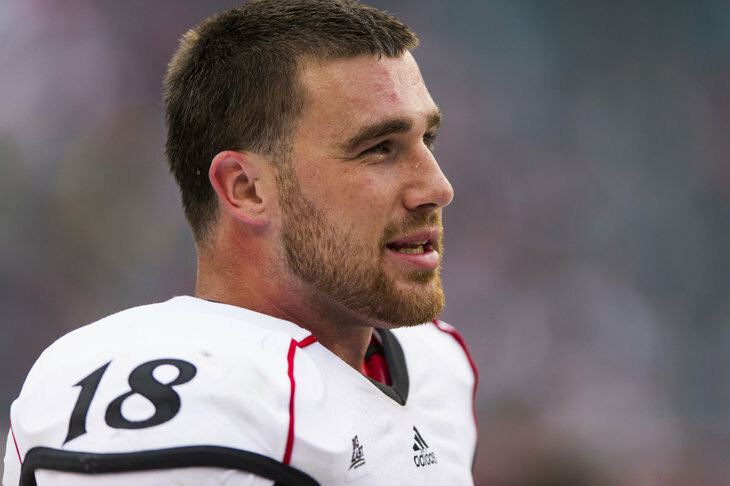 Is anyone else sick of hearing of Travis Kelce yet? We certainly aren’t. Kelce represents the C on a weekly basis. With Alex Smith helping him along, Kelce was without question the superior tight end in a game that included Rob Gronkowski. He was the leading receiver for the Chiefs, hauling in 8 passes for 93 yards and a touchdown. If you haven’t had the opportunity to sit and watch a Chief’s game yet, please do so. If you’re so inclined watch Kelce do work here, or here. Week 3 in the NFL is in the books as far as former Bearcats are concerned, and here is an update on how our favorite NFL players fared. Kevin Huber continues to impress in his comeback to the NFL after his season-ending injury last year, this time pinning the Titans inside the 5 yard line twice. A combination of Huber’s placement and great coverage by the punt team gave the Bengals a decided victory in Sunday’s field position battle. Derek Wolfe managed to grab a couple tackles and two assists in Denver’s loss to the Seahawks in what’s been a quiet start to the year for the Bronco’s DE. 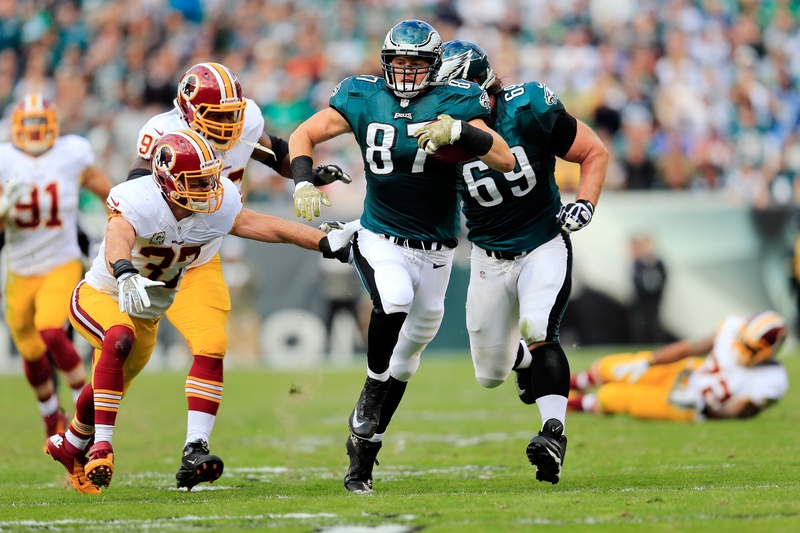 In the battle between Philadelphia and Washington, Brent Celek went his second game without a reception. Trent Cole was active on the defensive side of the ball with four tackles. 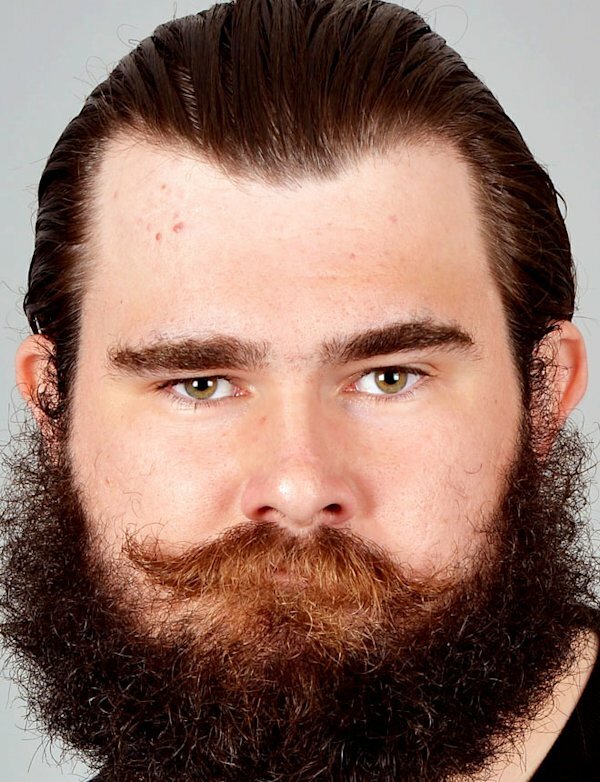 Jason Kelce has received praise in this young season for being the anchoring force of an O-Line decimated by injury, and has been credited with the success of the Eagles’ dynamic running game. However, in the third quarter, Kelce left with an abdominal injury. The Eagles managed to hold on for a hard fought victory, but there is no word yet on whether Kelce will play in next week’s game. The good news for the Kelce family is that younger brother Travis, who we wrote about last week, continues to emerge as a top tight end for the Chiefs and the NFL. The Chief’s finally managed to notch a 1 in the win column against the Dolphins and Travis managed to meet another milestone – his first career NFL regular season touchdown. I have a feeling we will be writing about Travis quite a bit as the season continues. Especially with his post TD moves. I mean it’s no river dance, but give him time. It is his first trip to the end zone, but there will be plenty more to come as the former Bearcat gets more and more looks in Andy Reid’s offense. Okay, end of excuses; moving along. 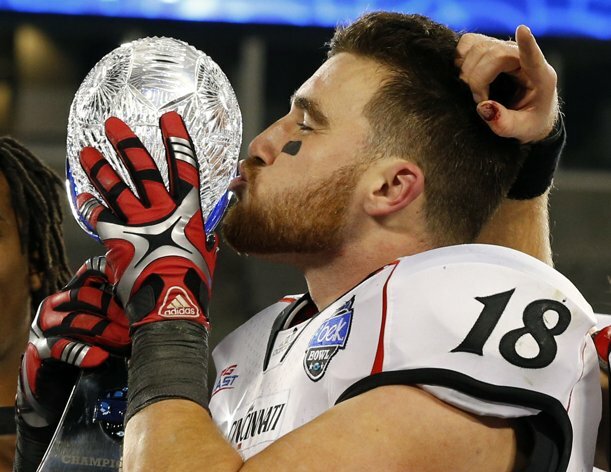 This week, we wanted to bring you an update on how some of your favorite former Bearcats performed on Sunday and Monday Night. 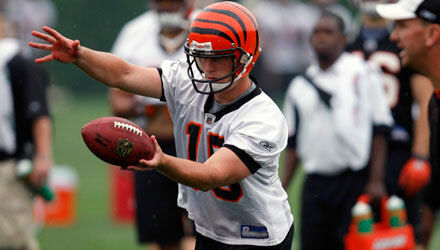 Playing for the hometown Bengals, Kevin Huber (P) had a good return to the regular season after experiencing a season-ending injury at the hands of everyone’s favorite team to hate, the Steelers. Against the Ravens, Huber was called upon four times, pinning the Ravens inside their own 20 three times. In Philadelphia there will never be a shortage of Bearcats to talk about as four former players suit up in green each week. Jason Kelce (C), Brent Celek (TE), Connor Barwin (LB/DE), and Trent Cole (LB/DE) all play a large role on offense and defense for the Eagles, and played no small part yesterday. The Eagles had the comeback of the day rallying from a 17-point deficit at halftime to win 34-17. Brent Celek had 3 catches for 15 yards, but played a large part (as he always does) in blocking downfield. Jason Kelce held the o-line strong in the second half and had a huge block on this touchdown run. Connor Barwin contributed two tackles to the Eagles effort. However, Trent Cole made the largest impact with four tackles and a game-sealing forced fumble against Jaguars quarterback Chad Henne, which was picked up and returned for a touchdown. A lot of the attention is going to Fletcher Cox and rightly so for a nice return of the fumble, but you can see Cole streak in and make the play possible here. 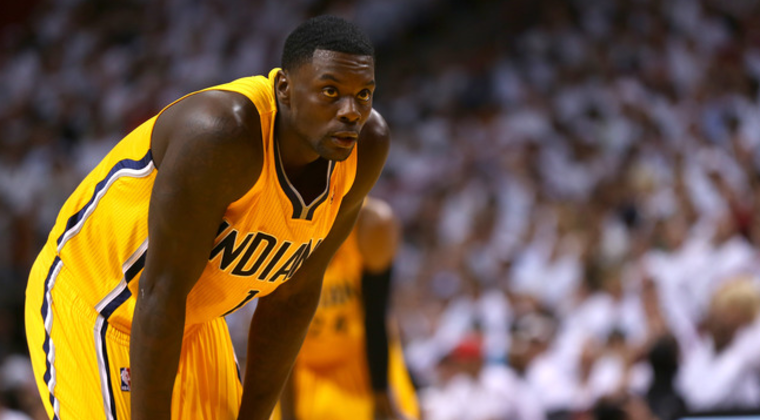 Last night, we reported on the possibility that Lance might not end up with the Pacers if they didn’t lock him in. Well, after an all-night negotiating session, the Charlotte Hornets have signed Lance Stephenson to a 3 year, $27 million deal. The Hornets will have a team option for the third season, giving them flexibility moving forward. Stephenson, on the other hand, will look to expedite future paydays after his perceived value was stunted following last season’s postseason quirkiness. Larry Bird had offered a 5 year, $44 million contract to Lance, but refused to come off those terms. The Hornets were weak offensively at the shooting guard and small forward positions, so it looks like the Charlotte community will get their fair share of Lance Stephenson. He was brilliant and erratic during the playoffs last year. I anticipate he’ll be more brilliant than erratic going forward. More coverage here. 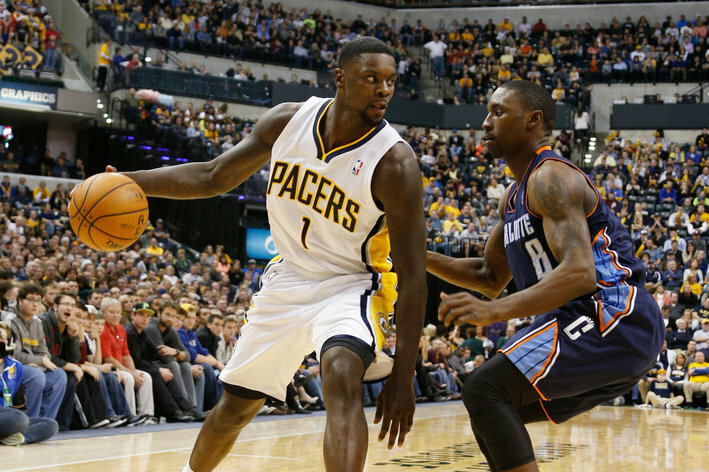 “Born Ready” Ready For New Contract; Who Takes a Chance on Lance? Now that the biggest NBA free agent is off the market and heading to Cleveland, there are only a handful of viable options left for teams looking to make big splashes and big changes. With Carmello staying in NY and K. Love’s landing still uncertain, the next biggest playmaker available is Lance “Born Ready” Stephenson. Tight ends receive a raw deal. They’re expected to both block and run routes with equal precision. Yet, most TE’s are valued based solely upon the number of catches they make and touchdowns scored. Rarely are intangibles put into statistic form. Brent Celek is arguably the best tight end to ever pass through the hallowed tunnel of Nippert Stadium. In the NFL (where statistics are king), a quick review of Celek’s year might show a statistical down year in 2013. However, while Brent’s numbers may have been down last year, he had the best blocking season of his career. More here.